A version of this article appears in The Hollywood Reporter with the headline: UTA Artist Space Celebrates First Anniversary With 'Haas Angeles'. The pioneering UTA Artist Space in Boyle Heights is celebrating its anniversary with a survey of works by Nikolai and Simon Haas, otherwise known as the Haas Brothers, Sept. 9 through Oct. 14. 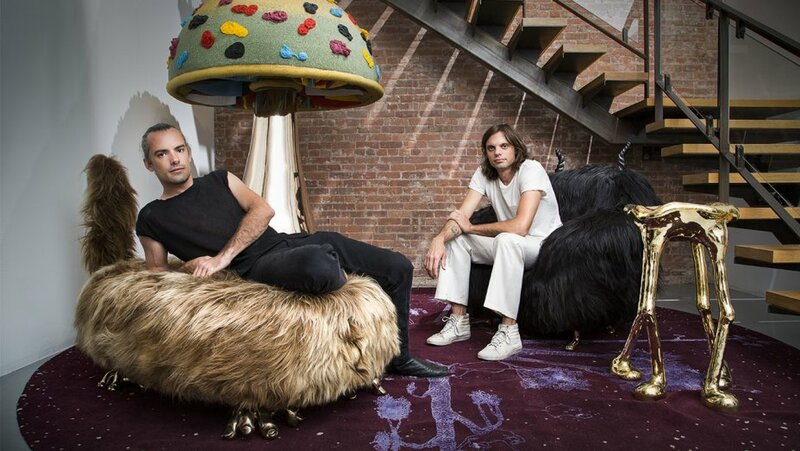 The 33-year-old art-and-design twins have been on the scene for just six years, but that’s enough for a full-scale survey (their first L.A. show), including furniture, installations and objets d’art. Brothers to actor Lukas Haas and sons to screenwriter Emily Tracy, the duo grew up with celebrity friends like Tobey Maguire, who helped kick-start their career by commissioning furniture for his office at Sony Pictures (they’ve also collaborated with Louis Vuitton on furnishings). Their new show includes fur-covered items and furniture with titles like Fleece-a Kudrow, a bench covered in black Icelandic sheepskin, Beyoncle, a hand-thrown porcelain accretion, and Armold Schwarzenegger, a white Icelandic sheepskin-covered item. The playful pair routinely emphasizes form over concept. Influences include their artist father, Berthold Haas, patron Donatella Versace, the conceptual metaphors of Yoko Ono, actor Vincent Gallo, whom Simon calls a “deep thinker” and “a conceptual extremist,” and Lady Gaga for whom they designed masks. The growing art scene in Boyle Heights has generated controversy, with the community’s Alliance Against Art-Washing and Displacement lobbing criticism at outlets including UTA Artist Space. Some saw the subject matter of its inaugural show by Larry Clark, which featured photos of teenagers shooting heroin, as insensitive to a community that struggles with addiction and gang violence. The Alliance also has criticized galleries for catering primarily to affluent outsiders.